Let me start this AKiTiO Node review by getting one thing out there first. Intel needs to stop crippling its Thunderbolt implementation and let eGPU go mainstream. Every major computer manufacturer has shown its commitment to USB-C and Thunderbolt 3 connectivity. CES 2017 brought an onslaught of external graphics card solutions. People want them and will pay for them. Intel has no excuse. As earlier reports pointed out, the AKiTiO Node TB3 board has the Texas Instrument TPS65983 (TI83) USB-C controller with Thunderbolt 3 support. Interestingly Apple’s first Thunderbolt 3 Mac, the Late 2016 MacBook Pro, only supports this TI83 controller. Older Thunderbolt 3 enclosures with the TI82 controller such as Razer Core, AKiTiO Thunder3, and Plugable TB3 docks do not have official support in macOS 10.12 Sierra. This is likely a software limitation Apple uses to restrict the implementation of external graphics cards on macOS. I’ve been using this AKiTiO Node with a Late 2016 13″ non-touchbar MacBook Pro. It’s an awesome setup…in Windows 10 that is. As soon as I installed Windows 10 through Bootcamp, the system immediately detected the eGPU and prompted me to install the appropriate drivers (for a GTX 980 Ti Hybrid). After a restart the MacBook Pro was up and running with a fully functional GTX 980 Ti Thunderbolt 3 eGPU. Nvidia Optimus was running to power the MacBook Pro’s internal display, all benchmark software and games were able to make use of the GTX 980 Ti without a fuss. It was beautiful. It’s another story in macOS. Even though the TI83 is compatible with the Late 2016 MacBook Pro and macOS recognizes the Thunderbolt 3 connection, there is a software block to prevent detection of the external graphics card. Many are working to come up with a solution. As far as the hardware itself, the only downside I’ve noticed with the Node is the PSU’s fan. It’s louder than it should be. 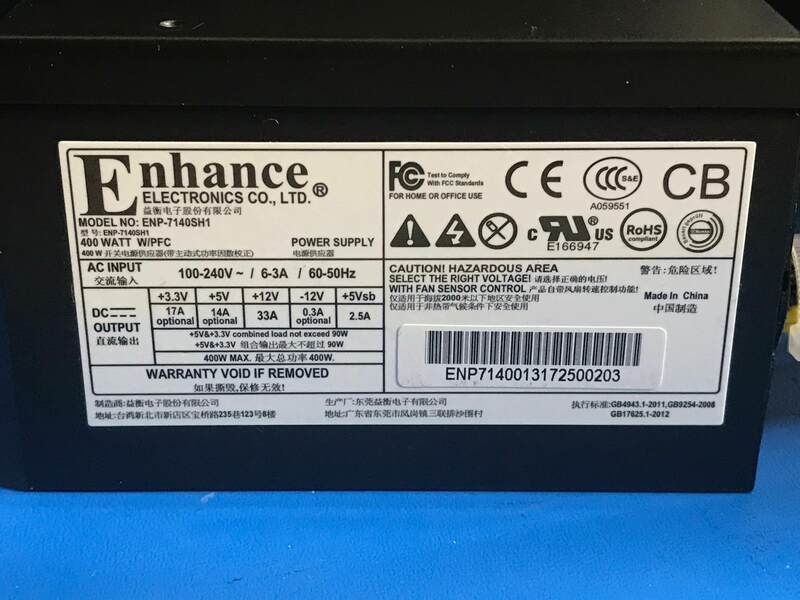 I disconnected the PSU fan (warning: you’ll void the warranty with this mod), and this eGPU is very quiet during operation now. You may have seen unboxing photos from an earlier AKiTiO Node post. The enclosure is bigger than you would imagine from seeing photos online. I like it to be honest. I’m sick of designs full of compromises. The Node enclosure and its size accommodates every double-wide GPU made. Look at the EVGA GTX 980 Ti and its liquid cooling components. Everything fits inside with room to spare. I have not put the outer case back on because I like the look of the eGPU this way. The 400W power supply is surprisingly small and has 3 PCIe cables. One 6-pin PCIe cable goes into the boards. The other two 6+2 PCIe cables are for the GPU. It’s plenty enough to power most graphics cards. I’ve even tried a Sapphire R9 Fury X which is a 400W TDP card, and the PSU has no issues keeping up under load. One nice improvement in this AKiTiO enclosure compared to other Thunderbolt expansion boxes I’ve used is the front fan and its mounting. There are two thumb screws holding a 120mm fan and its sliding bracket. I was able to mount the GTX 980 Ti radiator and fan without any modification because of this universal design and sizing. The best feature? Its price. I know $300 $245 is still a lot of money but compared to other options on the market, the AKiTiO Node is the most affordable all-in-one Thunderbolt 3 eGPU box. Another nice thing is AKiTiO’s support and involvement with the eGPU community. Many forum members have shared their stories and good experiences with AKiTiO’s customer service. I reached out to Razer and other eGPU makers for a demo unit to test and find a solution for macOS. AKiTiO was one of the two who shipped us a demo unit (Mantiz was the other). Intel NUC Skull Canyon – plug-n-play, fully functional. During my testings, I’ve found some frustration with Thunderbolt 3 implementation due to outdated Thunderbolt firmware. All Thunderbolt 3 equipped computers are capable of using an eGPU such as this AKiTiO Node. Yet some would show “External GPU Supported: No” in Intel Thunderbolt Software (Dell XPS 9350 is an example). The reason I’ve found is the NVM firmware and its communication with the TI83 controller. NVM firmware version 18 and newer would show support for external graphics cards. If you have a machine with an older NVM firmware, contact your computer manufacturer to expedite the release of new Thunderbolt firmware updates. 1/10/17 Update: The AKiTiO Node firmware update on 1/6/17 claims “Added: Support for Thunderbolt 3 hosts that do not support external GPUs”. Indeed it had. The Dell XPS and Late 2016 MacBook Pro are amongst the host devices which benefit from this new firmware. So why does Apple stop us from experiencing such a great solution for their thin and light laptops? Some may guess Apple is working on its own eGPU product; I highly doubt this. Given its design and sales strategies over the years, the only way Apple would ever implement an eGPU is through a sealed Thunderbolt 3 display, using a custom board GPU. Well, Apple stopped building displays. My opinion on this situation is the same as the Mac Pro tower vs. the newer Mac Pro trashcan. You can custom build the older Mac Pro to be much more powerful than its newer iteration. Apple wants tight control over its Mac lineup hierarchy. An eGPU would disrupt this order. Regardless of what Intel, Apple, and the OEMs decide to do, people want external graphics cards for the latest breed of computers. The AKiTiO Node is the first enclosure to push eGPU mainstream with its all-in-one box and reasonable price point. As a long time Mac user, I’d buy this Thunderbolt 3 enclosure and start making the switch away from Apple. Join our forum for latest Thunderbolt 3 eGPU development. Please share your thoughts in the comments or in our Thunderbolt Enclosure forum. Mate, thanks for your review, I am really with you. eGPU accelerated internal display is very easy in Windows through Nvidia Optimus or AMD XConnect. It’s still a lot of work in macOS atm. Great post. I am looking at building an egpu setup in the near future and am excited to read about what works and what doesn’t. I am curious to know if any of the new nvidia pascal cards work in bootcamp on Windows with the macbook’s internal display? The GTX 10X0 series should work fine in Windows. Will this enclosure downgrade backwards to support TB2 for older mbp? Thank you for getting this information out there. I was wondering if you had any idea whether a grx1080 would work in a similar boot camp setup? I tried the AKiTiO Node with a GTX 1070 and it worked in Bootcamp. The GTX 1080 should work the same way. One question though, how is the performance though? I know theoretically it should be no different from Razer core(TOO EXPENSIVE) and I know there will be some performance loss( 10~15%) but it will be still nice to see the actual numbers from benchmarks or some gaming review. The AKiTiO with latest firmware will work with the Razer Blade Stealth. Performance should be the same as the Razer Core if not faster depending on whether you plan on attaching peripherals to the extra ports on the Core. Hi How does it charge the Stealth Blade. It works great as an EGPU but I cant seem to be able to charge the Stealth which is nuts . 2 Hours of gaming then I have to recharge. The AKiTiO Node only provides 15W of power through the Thunderbolt 3 cable. This is not sufficient to charge a computer, especially during heavy use. I’m not familiar with the Blade Stealth but it sounds like it has only one TB3 port which is also used for charging. Do you think that this device will work on de hp spectre x360 i5, it has two thunderbold 3 ports?? I dont know if hp firmware could give problems?? There are existing Spectre X360 TB3 eGPU implementations using other enclosures: https://egpu.io/external-gpu-implementations-table/?table_filter=%22spectre%22 so the notebook is OK. The Node with newest firmware is too unlikely to be a problem, though are not yet available to be 100% sure. Hello itsage, thank you for the excellent review. You mention that the node has a 120mm fan, do you if it will mount a 140mm radiator/fan? You mention a universal mount, I’m hoping it has some room. The AKiTiO Node’s fan bracket has only 4 mounting holes for its 120mm fan. I don’t believe the larger 140mm would work with the bracket. There’s enough room to accommodate larger fans and radiator if you want to mod the mounting bracket. Legend, thank you! I guess one of these bad boys will do the trick: https://www.amazon.com/Bgears-Cooling-Fan-Adapter-140mm-Black/dp/B0043GMY1U . Thanks for the detailed review! I’d like to ask though, would this be compatible with my relatively old Acer Predator (G9-592) with Thunderbolt 3? I’ve lurked around Acer forums etc regarding egpu’s for my laptop, and found no definite answers. I’m not familiar with the Acer Predator G9-592 you have. eGPU will work with it for sure if the laptop has Thunderbolt 3 connectivity. I Need to get the PCIE to Thunderbolt daughterboard. Any ideas where I could find them online? Unfortunately no one sells these boards. The closest thing is the inXtron Thunderbolt HDK which costs more than the AKiTiO Node. 3) Noise can be an issue too like foe the Razer, any info on noise levels? 4) I was also looking at the intel NUC option, any feedback on noise ? performance against the laptop/egpu setup? I have bought an Akitio Node TB3 and a GTX 1080, but I have a problem in bootcamp win 10 in 2016 mbp15. Though sometimes it works, for most of time the windows fails to reboot or to recognize 1080, the system give me an error code 43 or 12, or the Nvidia control center with the latest driver shows me that “you are not using a display attached to an Nvidia gpu.” Anybody has some ideas to fix this problem? I am pretty sure that the gpu is not defective. For your error 12 start at [GUIDE] Macbook Pro: solving eGPU error 12 in Windows 10 . Also worth perusing how other 2016 mbp15 owners got their eGPU working in Windows. The Thunderbolt firmware update tool requires Intel Thunderbolt Software. You can try Intel Thunderbolt Software Version: 2.0.4.250 or 16.2.55.275. There are so many different version numbers? How does one make sense of it all? But when you look at details from the taskbar software notification Thunderbolt settings, you get things like PD firmware version and NVM firmware version. How do identify the mapping for these to Akitio’s numbers? Or more simply, how do I know my Akitio Node is running the latest available firmware version? But how do make sense of what I am seeing? How does this correlate to B1-25+4.3.3 and/or B1-23+3.6.1?